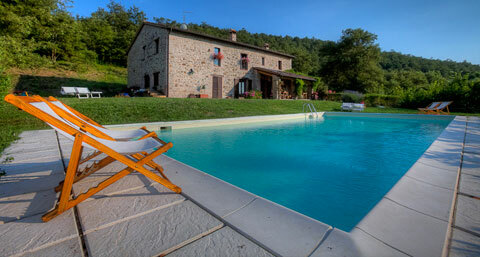 At the edge of a forest, 17th century stone farmhouse with a charming swimming pool in undiscovered and unspoilt Umbria. 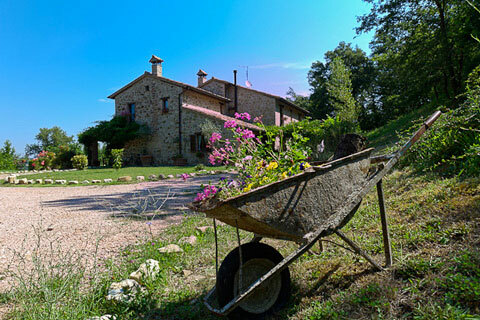 We offer a full immersion in the Italian lifestyle, focusing on wine, olive oil and food tasting. The house is laid out on two floors: the ground floor hosts the breakfast room with an ancient log fireplace and a living room with another fireplace, a big library, sofa and Sat TV; while the five bedrooms, each with private en-suite bathroom with shower, are on the first floor. 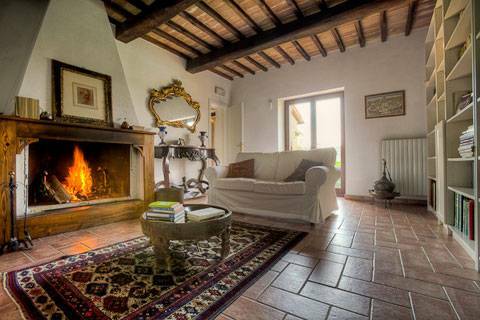 The farmhouse can be rented in its entirety or by the room. 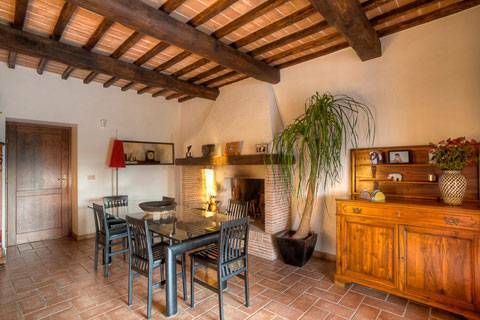 Casale San Bartolomeo is a great place for a family holiday! Our farmhouse encourages ‘togetherness’ and is a place where families can feel comfortable. We welcome children and offer a number of facilities to meet the needs of young ones. 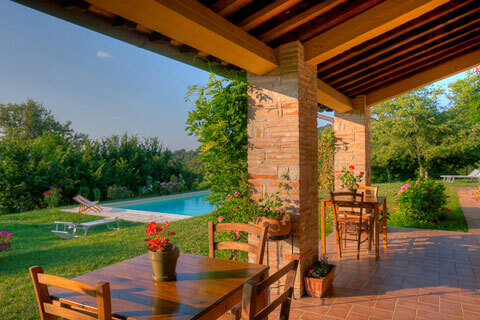 Located in the middle of Umbria, halfway between Todi and Perugia, Casale San Bartolomeo is only 1, 40 hr from Rome and Florence. Although in a rural location, Casale of San Bartolomeo is only 3km from Marsciano, a pretty village with many shops and excellent local restaurants. The house is laid out on two floors: the five bedrooms, each with private en-suite bathroom with shower, wc and bidet, are on the first floor. 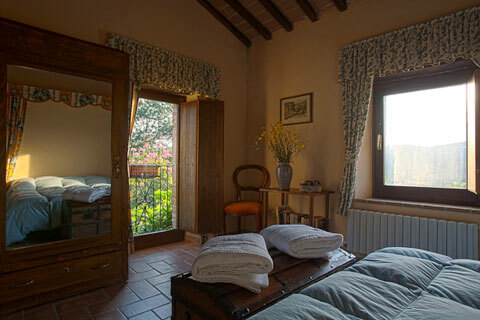 All rooms have original beamed ceilings and old terracotta floors. The ground floor consists of a cosy dining area with an ancient log fireplace and a living room with another fireplace, 2 sofa and plasma TV with Sky satellite service. At a certain point the E45 splits, branching off to the right towards Perugia. Take the branch of the E45 towards Perugia; do not continue straight towards Terni. About 800m after the signs, you will come to a roundabout. At the roundabout, follow the signs for 'centro sportivo' and 'polo scolastico'. You will come to another roundabout and, a short distance after that, a turn-off. Turn left, following the signs 'verde pubblico' and 'Azienda Le Fercete'. You will see signs for Collelungo; follow them and after about 2 km on the right you will see a sign for San Bartolomeo. From here the road, approximately 800 metres, is unpaved." About 500m after the signs, you will come to a roundabout. At the roundabout, follow the signs for 'centro sportivo' and 'polo scolastico'. You will see signs for Collelungo; follow them and after about one kilometre on the right you will see a sign for San Bartolomeo. From here the road, approximately 800 metres, is unpaved."